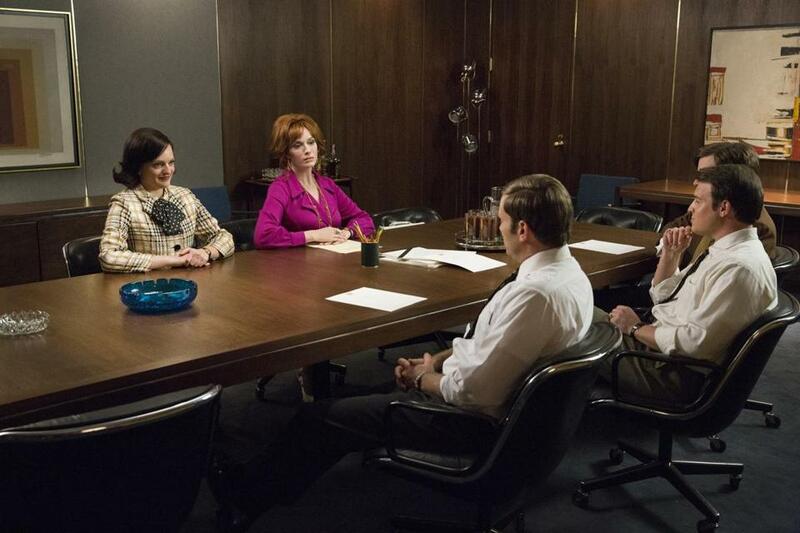 One scene that I remember in great detail from “Mad Men,” a TV series filled with countless perfectly shaped scenes, has been haunting me since the #MeToo movement began in the fall. It has reminded me that, of all the new and old TV shows that have addressed inequality and sexual misconduct in the workplace, along with that great co-conspirator, toxic masculinity, “Mad Men” is the best. The drama took on all kinds of big themes in its seven seasons — identity and personal history, advertising and human nature — but none so much as the bane and insidiousness of sexism. It showed us a more naked version of the gender bigotry that has continued to undermine work culture a half-century later. From late in the first season, the scene, almost wordless, is a telling little microcosm. It’s set at a bar after work, just after Peggy Olson, still a newcomer at the show’s advertising agency, learns that her Belle Jolie lipstick campaign has been accepted. Gleeful, she finally feels as if she just might buck the odds and realize her dream of becoming a female copywriter. Someone puts Chubby Checker’s “The Twist” on the jukebox, the women — secretaries and switchboard operators — scream with pre-Beatles excitement, and the bar is hopping. Mid-dance, Peggy sees Pete Campbell sitting, watching from the side, pouting. She’d slept with him earlier that day, and so she starts twisting her way toward him, without a hint of feminine timidity, hoping to cheer him up on her happy day. “Dance with me,” she says when she reaches him, emboldened by her office success, willing to be the aggressor. “I don’t like you like this,” Pete says to her. That’s all he says, as, crestfallen, she returns to the dance floor and eventually wipes away a tear, actress Elisabeth Moss gradually and heartbreakingly registering the slap-down. But Pete’s meaning is clear: He doesn’t like her feeling empowered. He doesn’t like the fact that she has been celebrated by his male colleagues and is poised to invade the boys club. He wants women to remain in servitude to men, and her decision to dance toward him, a show of physical and psychological confidence, makes him feel unneeded and impotent. “Women are not supposed to be bold” — he might as well have thrown that old chestnut at her. The title “Mad Men” refers to Madison Avenue, which is identified with the ad industry, but it also refers to male anger, of which Pete — who goes on to force himself on a young au pair later in the series — has plenty. It was a small moment between Pete and Peggy, but that’s what I’ve prized about it. So much of the discrimination and harassment in workplace culture is based on these kinds of small moments — a compliment or a pat on the shoulders that objectifies, a look of disapproval that stifles, a wink that demeans. A man with more power humiliates a woman for reaching beyond her ken. There would be little for Peggy to say to a sympathetic friend about her treatment by Pete at the bar, and yet he essentially told her to back down, to be submissive, to make herself smaller. Don Draper wound up marrying his secretary, Megan, instead of the more self-assured and professionally driven Dr. Faye Miller, for the same reason. “Mad Men” was filled with scenes built on the oppressive behavior by the men toward the women — and, at times, by the women toward the women. A number of central characters — Joan Holloway and Betty Draper, in addition to Peggy — were consistently part of the show’s ongoing narrative about women and sexism. Betty may have had the hardest road, in a way, as a symbol of the cold misery that can visit upon a passive woman who has been inappropriately consigned to homemaking and parenthood. But no wait, it’s probably Joan, who was essentially prostituted out to a Jaguar executive in exchange for the account, mistreated as her boss’s lover, and later raped by her husband. Joan often had little patience for Peggy and her ambitions, and the two were famously at odds with each other, as they took different approaches to the glass ceiling. Still, underneath their clashes, I always thought I sensed a mutual respect. It’s darkly ironic, of course, that “Mad Men” revolves so consistently and intelligently around these issues, and yet its creator, Matthew Weiner, has been accused by former “Mad Men” writer Kater Gordon of sexually harassing her. Across the series, Peggy eventually found a path away from the box her male co-workers had planned for her. With the help of a historical shift in women’s rights and her inner growth over the years, she found a way to both live and display her belief in herself. The “Twist” scene from the first season is bookended by a much-commented-on scene from the final season, when Peggy walks into the office of McCann Erickson for her new job. Her swagger is awesome, as she is now the power player we knew she could be. She has sunglasses on and a cigarette dangling from her lips, still likely to experience the misogyny of colleagues, but far more resilient and wise than she was when she was still forming, when Pete tried to douse her spark.